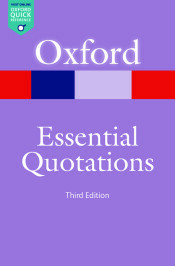 Oxford Essential Quotations covers the most popular and widely-used quotations, plus it includes a selection of less well-known but equally memorable contemporary sayings. Always unlocked and accessible to global users of Oxford Reference, it has recently been updated with new quotations covering Australia and New Zealand, Media Studies, and Business and Management. In today’s globalised and instantly shareable social-media world, heads of state have to watch what they say, just as much – and perhaps even more so – than what they actually do. The rise of ‘Twiplomacy’ (Twitter now being the social media channel of choice for world leaders to reach large audiences) and the recent war of sound bites between Donald Trump and Hilary Clinton speak to this ever increasing trend. Despite the seeming ubiquity of the one-liner, this is in fact nothing new. World leaders have always harnessed the power of short slogans and memorable statements to capture the popular imagination. Winston Churchill was famously described as having ‘mobilized the English language and sent it into battle’, whilst Boris Yeltsin memorably quipped ‘You can build a throne with bayonets, but you can’t sit on it for long.’ Foreshadowing the refrains of today’s presidential debates, President Kennedy once jibed ‘Do you realise the responsibility I carry? I’m the only person standing between Nixon and the White House.’ With these witty refrains in mind, test your knowledge of world leaders and their retorts – do you know who said what? Featured image credit: Earth Globe Antique by PIRO4D. Public Domain via Pixabay. Quiz image credits, in order of appearance: Earth by PIRO4D. Public domain via Pixabay; Jelly Beans candy by skeeze. Public domain via Pixabay; Phone dial old by 526663. Public domain via Pixabay; Books pages story by Unsplash. Public domain via Pixabay; Spectacles glasses vision by MabelAmber. Public domain via Pixabay; Army boots worn by B_Me. Public domain via Pixabay; Ball glass reflection by FeeLoona. Public domain via Pixabay; Tin Soldiers by Donations_are_appreciated. Public domain via Pixabay. This quiz has been created by the Oxford Reference marketing team.